That’s what’s frightening about this map. I drew it up all from memory. It’s just scary that I know the system map by heart, pretty much. Of course, that’s good considering where Mom, Sis, and I are going on the 9th. 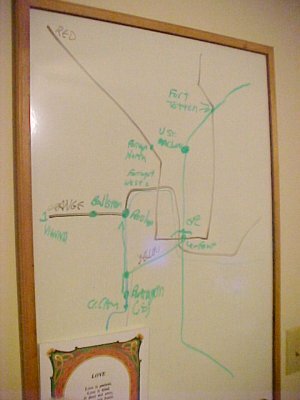 We’re going to DC, and so I drew this map up on my little white-board to show them where we were going. The battle plan, if you will, for our visit to DC to take lots of pictures (my goal) and to shop (their goal). This plan takes both into account. My plan during the day (since sunlight is crucial for me), and their plan afterwards. The only big problems with my map that we’re lacking a curve on Green Line (around Georgia Avenue-Petworth), Red Line crosses Green Line two stations too low (my map shows it crossing at L’Enfant Plaza, and it should be Gallery Place-Chinatown), and I’m missing a curve on Blue Line (at Arlington Cemetery). The stations noted on this map, by the way, are the stations we’ll be visiting. We go from Vienna to Farragut West, where I’m photographing Farragut Square. From there, we catch Red Line at Farragut North, and travel to Fort Totten. Photos. From Fort Totten, we get on the Green Line, and are traveling to U Street to visit the African American Civil War Memorial. That’s the end of my formal photo shoot. From there, back on Green Line to L’Enfant Plaza, and transfer to Yellow Line. Take Yellow to Pentagon City. Shop. Then take Blue Line to Rosslyn, transfer to Orange Line, get off at Ballston. Shop at Ballston Common Mall. Back on Orange Line, and off to Vienna! Isn’t that fun? Quote: "People will think you just got out of the home!" - Mom, on the Botanical Gardens trip.